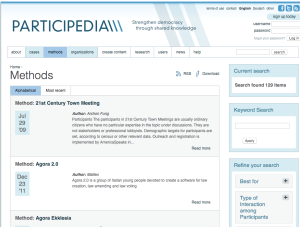 Participedia – really valuable info, unfortunately pretty hard to access. Please find below a quick-fast public proposal for an updated knowledge base on “what really works” for civic engagement and democratic participation. Offered in a spirit of community-building. Knight Foundation – landscape report, Dec. 2013, new one…? Matt Stempeck has a longtime spreadsheet & list of research & projects that he’s probably been looking to liberate in other ways, we should bug him about it. Simpler: easier to browse categories. Topics such as “voter registration”, “election turnout”, “community feedback platforms”, “how government works education”. Prescriptive: I won’t hold back from making specific project recommendations to pilot. “Given your low local voter turnout, research shows your city should pilot an experiment with these two SMS platforms.” Clearly, this doesn’t necessarily build the local coalition & broad government supported needed to decide to take the (usually low, but real) risk of a new participation project, but it would hopefully provide a spark. Testing real projects out in the wild of U.S. cities, not more discussion amidst the civic-tech “choir”. No additional new research is implied in this specific proposal for a better-designed site! First, hopefully, getting everyone on the same page of what’s been covered, and what the biggest opportunities for research are, before TicTec 2016 from mySociety UK in Barcelona on the 27th of this month. Which, if anyone could cover my flight there with a charitable contribution, I’d love to attend in-person. We’ll do it in our typical popular, accessible design (see our siblings: Fight For the Future), get everyone in the bullet-points above to shout it out as a new resource, and promote it via Civicist and CFA channels. Sound valuable? Get in touch to draft a one-page scope-of-work and timeline, we’re always seeking charitable funding support to build public knowledge of libre research. Email: david at ppolitics.org, @ppolitics on Twttr. We’re easy to reach and eager to start.